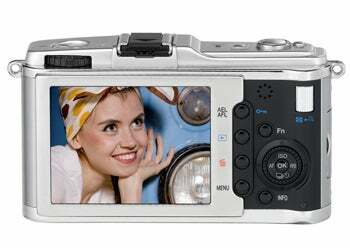 Panasonic and Olympus presented new digital cameras at the IFA electronics fair in Berlin on Thursday that are based on the Micro Four Thirds format. Micro Four Thirds cameras are aimed at users who want better photos than a compact camera can provide but don't want a larger device. They allow for interchangeable lenses but are smaller because there is no reflexive mirror like that found in SLRs. Right behind the lens is an image sensor that provides both a live preview and captures the image. Because the user sees the live view from the camera's image processing circuitry it's possible to adjust settings such as the shutter speed and see what effect they'll have on the final image, before the picture is taken. 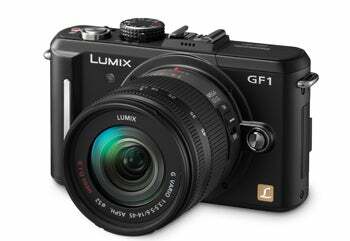 Panasonic's DMC-GF1 camera has a 12-megapixel lens and within the Micro Four Thirds format is the smallest and lightest camera with a built-in flash, it said. The company also showed six lenses that work with the camera and in keeping with its small size, the lenses were smaller too. For example the equivalent of a 40 mm pancake lens would be a 20 mm lens for the GF1. The camera can shoot up to 60 frames per second and can record 720P high-def video in AVCHD Lite, the company's video codec. It will launch in Japan on Sept. 18th and will be priced just under ¥90,000 (US$975). Pricing and launch details for other markets wasn't announced. The Olympus camera is styled on its iconic "Pen" camera, first launched in 1959 with the concept of making a camera as simple to use as a pen. The new model, the E-P1, has classic stylings that bring a retro feel to the camera. But while it might look old fashioned on the outside it's high-tech on the inside with a 12-megapixel image sensor, 20 shooting modes and face detection. 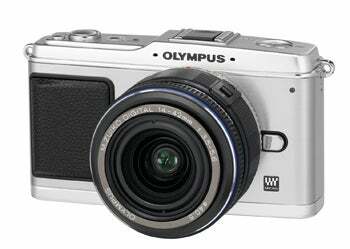 Olympus said the camera would launch in September but didn't provide a price. With a compact frame, a pop-up flash, interchangeable lenses, HD video-shooting capabilities, and simple-but-versatile controls, the Panasonic Lumix DMC-GF1 is an excellent alternative to an entry-level DSLR.